E. N. a respectable citizen of this town, lately deceased at the age of 78, has repeatedly mentioned to the writer, that he was among the Indians, who destroyed the tea at Boston in 1774. That’s one of the earliest examples of a Boston-area man identified in print as having helped to destroy the tea on 16 Dec 1773—more than forty years before. And even so, Bartlett waited until the man was dead and identified him only by his initials. 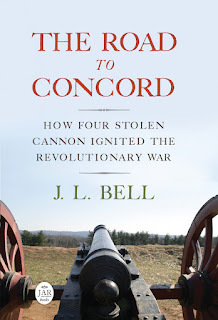 Except that a couple of footnotes later, Bartlett named the late Eliphalet Newell as one of the town’s Revolutionary War officers. The two men helped to found Charlestown’s first lodge of Freemasons in 1783, and worked together as directors of the Charlestown Lottery. The Independent Chronicle newspaper for 15 July 1813 confirms that Eliphalet Newell had recently died at Charlestown. So it’s mighty clear which “E. N.” Bartlett was writing about. Most likely a lot of people in Charlestown knew as well, but they were still keeping the secret among themselves. Bartlett said that Newell died at the age of seventy-eight, meaning he was born about 1735. The baptismal records of Charlestown’s first meetinghouse confirm that. Curiously, the newspapers of 1813 state that Newell died at age seventy-one. Usually aged veterans of the Revolution added a few years.